This utility displays the name of the current symbol and the current period in the chart background in a large font. It is very convenient, e.g. when you use multiple charts with different symbols, period or when saving a chart screenshot. The information is displayed in two lines. 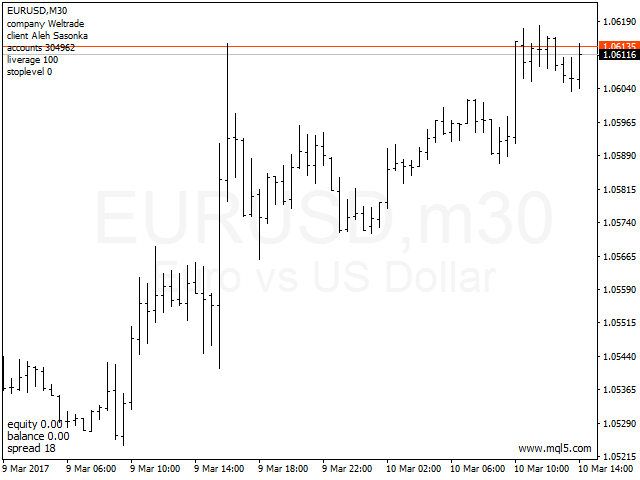 In the first line, the chart symbol and current timeframe are shown in a larger font (e.g. AUDUSD,h1). In the second line, the full name of the current symbol is displayed in a smaller font (e.g. 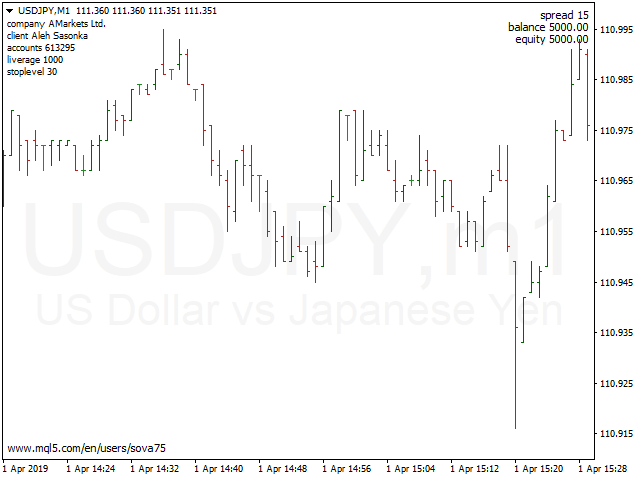 for GPBJPY it shows "Great Britain Pound vs Japanese Yen"). It is possible to hide the second line. The background label is displayed in the center of the graph. If you change the size of the chart window and the background label has moved from the center, after a while it will move back to the center. 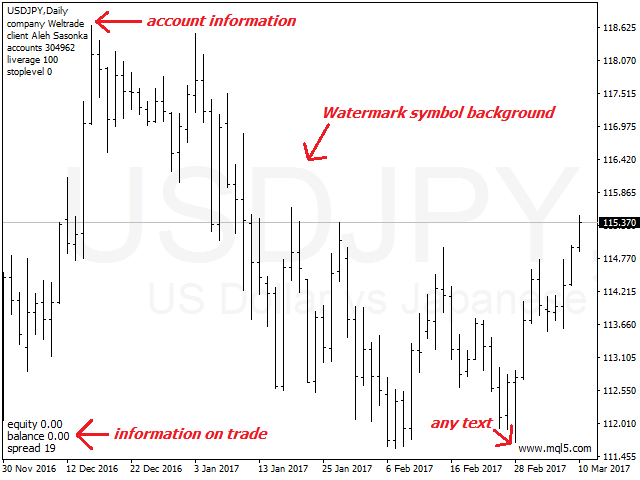 It is possible to attach a watermark to the corner of the chart. In addition, you can place the text information of the user in any corner of the chart to choose from. 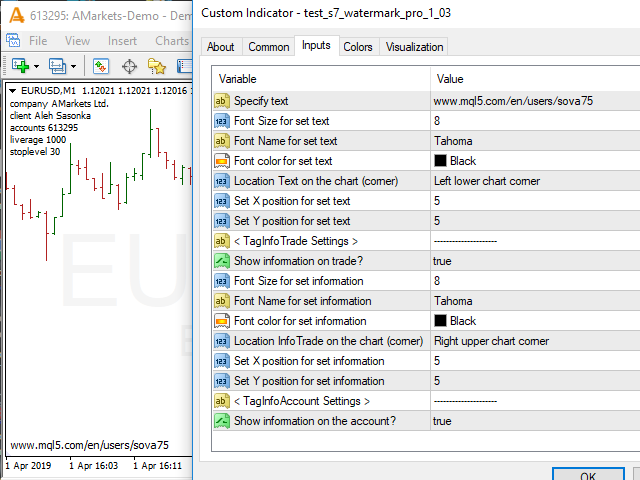 In the upper-left corner, the tool displays information about the name of the broker, the client's name, account number, current leverage and stop levels allowed on this account. In the settings you can change the font of text information, its size and color. Display of additional information can be disabled. Show full name of the current symbol? - Show the full name of the current character? Placed Watermark in the center? - put a watermark in the center? 1. Added the ability to bind the user's text to the corners of the chart. 2. 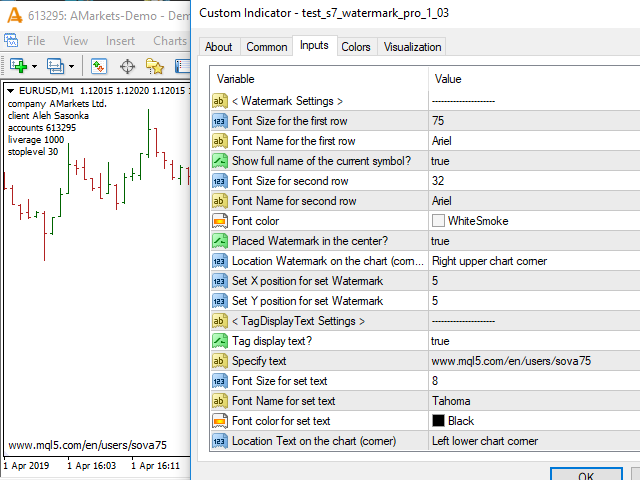 Added the ability to bind trading information to the corners of the chart. 1. Added the ability to hide the full name of the current symbol. - Show the full name of the current character? 1. Fixed a bug when displaying balance information. 2. Added the ability to bind a watermark to the corners of the chart. - Placed Watermark in the center? - Location Watermark on the chart (corner). - Set X position for set Watermark. - Set Y position for set Watermark.